While philosophical analyses of consciousness began with Descartes, the scientific study of consciousness was delayed until the beginning of the 19th century and the emergence of scientific, as opposed to philosophical, psychology. The first problem for the new psychology was the nature of sensory experience -- that is, conscious sensory experience. In this way, scientific psychology began, quite expressly, as the scientific study of conscious experience. The initial emphasis on sensation -- as opposed to memory or thinking or some other aspect of consciousness -- was quite deliberate, because the earliest psychologists understood that, in order to be scientific, they had to be able to tie conscious experience, which is inherently subjective, to the objective world of physical events. And so they began by exploring the relations between subjective sensory experiences -- what the philosophers call qualia -- and the objective physical stimuli that gave rise to them -- hence, the new field of psychophysics. With respect to qualia, we can distinguish, along with Kant, qualitatively different mental states of knowing, feeling, and desiring. To paraphrase Nagel, there is something it is like to know something, and that "something" is different from what it is like to feel or desire something. The basic (and, if Kant is right, irreducible) mental faculties of knowledge, feeling, and desire are associated with distinct qualitative experiences of knowing, feeling, and desiring. 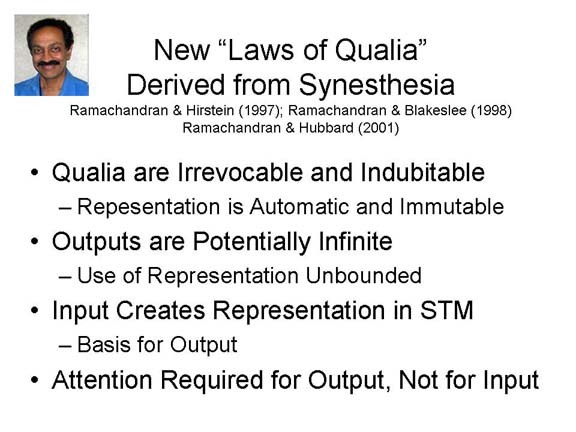 If Searle is right, each of these superordinate qualia is associated with a different form of intentionality, but there's obviously more to qualia than that. there's something it's like to hear a flute, which is different from what it is like to hear an oboe. there's something it's like to see something, which is different from what it is like to hear something. So, to begin with, how do differences arise in modality of sensation -- what's the difference between seeing something and hearing something? Sensation is the result of some pattern of physical energy radiating from some object and impinging on an organism's sensory organs -- organs which are composed of specialized neural tissue, and which are connected to the central nervous system by afferent nerves. How many senses are there? Writing in the 4th century BCE, Aristotle (in De Anima) famously identified five senses: vision (seeing), audition (hearing), olfaction (smelling), gustation (tasting), and touch (touching and feeling). That's a good start (Aristotle is always a good start), but following Sherrington (1906), we can identify at least nine different sensory modalities, or general domains in which sensation occurs. These modalities may be arranged hierarchically (of course! ), beginning with a division into three broad categories, exteroception, proprioception, and interoception. Within each of these categories, there are (of course!) further subcategories. Exteroception is the sensation of events occurring outside the body, and includes three subcategories. Audition (hearing), in which sound waves stimulate hair cells on the basilar membrane of the cochlea of the inner ear. Olfaction (smelling), in which airborne chemical molecules stimulate receptors in the olfactory epithelium of the nose. The thermal sense of temperature, in which the temperature differential between the object and the skin (that is, whether the object is relatively warm or cold, compared to the skin itself) stimulates corresponding receptors buried in the skin. It turns out that there are actually two distinct thermal senses, warmth and cold, but we aren't there yet. And then there is nociception, or the sensation of pain. Proprioception concerns sensations that arise from within the body itself, particularly its motion and its position in space. In equilibrium, also known as the vestibular sense, gravitational force pulls on crystals suspended in liquid in the semicircular canals and vestibular sac of the inner ear; these crystals then fall on hair cells arranged in various orientations. In kinesthesis (sensation of the motion of the body), the stretching of the muscles, contracting of the tendons, and movement in the joints stimulates specialized nerve endings located nearby. There are also analogues of the cutaneous senses allowing us to feel touch, temperature, and pain inside the body as well as outside -- as anyone who has eaten too much, or drunk very hot or cold liquids, or had a stomach ache can attest. These are really just special cases of the skin senses described above. For Sherrington, interoception consisted of mechanisms responsible for homeostatic regulation, such as hunger (which is sensitive to blood sugar levels) and thirst (which is sensitive to levels of cell fluids. Technically, these count as sensory mechanisms, because they convert physical stimuli into neural impulses that are processed by the nervous system to generate response outputs (like eating and drinking). But because they do not give rise to conscious sensations (you feel hungry or thirsty, but you don't feel your blood-sugar or cell-fluid levels), they don't interest us here. Notice, in passing, that many of the nine senses are variations on two different mechanisms. In vision, gustation, olfaction, and (probably) the temperature sense, the proximal stimulus is a chemical reaction of some kind. In audition, the tactile sense, kinesthesis, and equilibrium, the proximal stimulus is mechanical in nature. It seems likely that, over the course of evolutionary time, these senses progressively differentiated from two primitive sensory modalities, involving photochemical and mechanical stimulation, respectively. But how do we know that Sherrington was right and Aristotle was wrong? On what basis did Sherrington define his nine sensory modalities? He did it by relating sensory experience to physiology, by assuming that each sensory modality was associated with a unique "package" of neural features. The organization of the sensory modalities illustrates the basic concept of transduction: the conversion of some physical stimulus energy into a neural impulse. Looking over the sensory modalities, it appears as if each sensory receptor is specifically responsive to a different proximal stimulus energy (which, in turn, radiates from a distal stimulus). In transduction, a particular type of physical energy is converted into a neural impulse, which is carried via a sensory tract to a particular part of the brain known as a sensory projection area. Thus, in vision, the proximal stimulus consists of light waves (electromagnetic radiation) emitted by or reflected from an object. Not all light waves give rise to the experience of seeing, however; in humans, only wavelengths of 380-780 nanometers (nm, or billionths of a meter) are visible. Other wavelengths, such as infrared (greater than 780 nm) and ultraviolet (less than 380 nm) are not visible to the human eye. In any event, light waves pass through the cornea and lens of the eye, which inverts the image and focuses the light on the retina on the back of the eyeball. This is the retinal image. There, light waves impinge on two types of receptor organs: rods and cones. The rods, of which there are about 100 million, are stimulated by different levels of brightness (intensity); they are responsible for black-white vision, and are especially important for seeing at night. The cones, of which there are about 5 million, are stimulated by different wavelengths of light; they are responsible for color vision, and are particularly useful during the day. Once transduction has taken place, the neural impulses travels via the bipolar cells and the ganglion cells to the optic nerve, or cranial nerve II, which serves as the sensory tract. They cross the optic chiasma, a division in the optic nerve which projects each half-field to the opposite hemisphere of the brain. Thus, retinal images from the left visual field of each eye project to the right hemisphere; and retinal images from the right visual field of each eye project to the left hemisphere. It is this fact which permits the "split brain" experiments which have been so important in teaching us about hemispheric specialization: stimuli presented to the left visual half-field project to the right cerebral hemisphere, and vice-versa. In the intact brain, these images are also transmitted between the hemispheres; but this transmission is impossible when the corpus callosum has been severed. Of course, by strategically moving the eyes, an image projected on the right half-field can also be brought into the left half-field, and vice-versa. For this reason, in split-brain experiments the stimuli are presented very briefly, and disappear before the eyes have a chance to move. Farther along on their journey to the brain, the visual impulses pass through the lateral geniculate nucleus (LGN), a bundle of neurons which is part of the thalamus. Each cell in the LGN corresponds to a particular part of the retina; thus, the LGN processes information about the spatial organization of the visual image. With the primary exception of olfaction, most afferent impulses pass through the thalamus on the way to their sensory projection areas (olfactory impulses go directly to a part of the brain called the olfactory bulb). Thus, the thalamus acts as a kind of a sensory relay station, directing impulses representing various modalities to their appropriate cortical projection areas. Finally, the visual impulses arrive at their sensory projection area, which is the visual cortex of the occipital lobe, known as V1, or Brodmann's area 17. Again, each cell in the visual cortex corresponds to a particular part of the retina, in what is known as retinotopic organization. In audition, mechanical vibrations in air stimulate hair cells in the basilar membrane of the cochlea in the inner ear. In gustation, chemical molecules dissolved in saliva stimulate the taste buds surrounding the papillae of the tongue (and perhaps elsewhere in the mouth). In olfaction molecules dissolved in the mucous membrane stimulate receptors in the olfactory epithelium. In touch, mechanical pressure (as well as vibration and electrical stimulation) stimulates certain receptors buried in the skin. There are, in fact, a bunch of these, including free nerve endings, perifollicular or basket endings, Merkel's discs, Meissner's corpuscles, and the Pacinian corpuscles. In temperature a heat differential stimulates certain other receptors: relative cold stimulates the Krause end-bulbs, while relative warmth stimulates the Ruffini end-organs; "hot" stimuli stimulate both kinds of receptors. In ordinary cutaneous pain, inflammation of injured skin tissue stimulates free nerve endings. In kinesthesis movements of the skeletal musculature stimulate specialized nerve endings embedded in the muscles, tendons, and joints. And in equilibrium, by virtue of gravitational force, rotary and linear motion of the head causes on crystals floating in the semicircular canals and vestibular sac of the inner ear to fall on hair cells.that stimulate hair cells. Put another way, we see electromagnetic waves, and we hear sound waves, etc. This would be a very nice system. Unfortunately, the modality of sensation is not uniquely associated with any particular stimulus energy, or with any particular sensory receptor. For example, other stimuli can lead to a particular sensation. If you close your eyes and press your finger lightly on your eyelid, you will experience the sensation of touch stemming from pressure that deforms the surface of the skin. But you will also experience the sensation of vision, in terms of various lights and colors. Thus, a particular proximal stimulus (pressure) somehow stimulates the receptors for vision as well as those for touch. Similarly, if you box someone's ears (please don't do this, just take my word for it!) the victim will experience touch (to put it mildly), but also a ringing of the ears. As another example, direct electrical stimulation of the sensory receptors will elicit a corresponding sensory experience, even in the absence of the appropriate proximal stimulus. "Sensation consists in the sensorium's receiving... a knowledge of certain qualities.... of the nerves of sense themselves; and these qualities of the nerves of sense are in all different, the nerve of each having its own peculiar quality or energy." According to Muller, the modality of sensation is not determined by the proximal stimulus alone, but rather by the stimulation of particular nerves. These nerves are ordinarily responsive to some specific proximal stimulus, but they can also respond to others. You can have a sensory experience without a proximal stimulus, so long as some particular receptor organ is stimulated. The implication is that the modality of sensation is not determined by the proximal stimulus, but by the sensory receptor organ that happens to be stimulated. As it happens, this isn't quite true either. In the first place, we now know, from the Nobel Prize-winning work of Lord Adrian, that the neural impulses generated by the different receptor organs are all the same -- they're electrical impulses known as action potentials. It's not the case that the rods and cones generate one kind of "nerve energy", and the hair cells in the cochlea generate another kind. All neural impulses are identical, in that sense. Just as all the wires in a radio carry the same electrical current, regardless of their size or composition or the color of their insulation, all neurons generate the same action potentials. The proof comes from electrical stimulation of the afferent nerves leading from the receptor organ to the central nervous system, or of the sensory projection areas in the cerebral cortex. Either case produces sensory experience in some modality, vision or audition or whatever, even though there has been no proximal stimulus in the usual sense nor any activity in any sensory receptor per se. the sensory projection area in the cortex, a particular area of the brain which is the final destination of afferent impulses arising from the sensory receptors and transmitted along the sensory tracts. to Area V1 (Brodmann's area 17), the primary visual area in the occipital cortex. to Area A1 (Brodmann's area 41), the primary auditory area in the temporal cortex. Pain is an interesting case, and I'll discuss it in more detail later. Although in principle, the modality of sensation is determined by four factors (proximal stimulus, receptor organ, sensory tract, and sensory projection area), in the final analysis the projection area is the most important. If the auditory nerve were connected to the visual cortex, we would see sounds instead of hearing them (we know this because direct electrical stimulation of the visual cortex produces visual sensations). Regardless of where the sensory impulse comes from, what matters is where it goes. The Doctrine of Specific Nerve Energies is correct, but the nerve energies in question have more to do with the sensory projection areas than they do with the sensory receptors or the sensory tracts. With respect to the four characteristic features of a sensory modality -- proximal stimulus, receptor organ, sensory tract, and projection area -- some modalities -- especially vision and audition -- are clearly organized and well understood. The other modalities are apparently more complicated; certainly they are more poorly understood. For example, the chemical senses interact. (1) a head cold clogs the nasal passages, preventing the person from smelling properly; but food is also tasteless. (2) Cigarette smoke clogs the taste pores, but perfume is also odorless. The skin senses are hopelessly complex. At least six different nerve endings are found in the skin, but there is no isomorphism (1:1 relation) between the type of receptor, and the corresponding sensory experience when that receptor is stimulated electrically. To make things worse, neural impulses from all six receptor types are transmitted along the same afferent tracts to the spinal cord and up to the brain, and all project to the same somatosensory cortex in the parietal lobe. So the puzzle is: how are the skin senses kept separate? There is a prize for the person who comes up with the best answer, which you can collect in Stockholm. Consider, as well, the experience of pain -- a common example offered in philosophical discussions of qualia. There is no unique proximal stimulus for pain. Almost any stimulus will produce pain if it is intense enough: sound, light, heat, or cold are good examples (it is not clear if intense tastes and odors are actually painful, no matter how unpleasant they might be). Moreover, pain is also produced by muscle fatigue, and by the introduction of salt and other chemicals into wounds and other openings in the skin. There are no unique receptors for pain, either. This follows from the fact that pain can be experienced in (almost) all sensory modalities. There are free nerve endings in the epidermis of the skin that are sensitive to pain; but they are also sensitive to touch and temperature, and besides they are only sensitive to cutaneous pain. And pain may be experienced in areas of the skin that lack free nerve endings. Finally, there is no unique (3) sensory tract, or (4) projection area, for pain. Again, this is so because pain is experienced in (almost) all sensory modalities. Even cutaneous pain is not separate -- it is carried along the same afferent tracts, and projects to the same somatosensory area, as painless cutaneous stimulation. The stimulation of a single tooth results in the eventual activation of no less than five distinct brain-stem pathways.... Two of these pathways project to cortical somatosensory areas 1 and II, while the remainder activate the thalamic reticular formation and the limbic system, so that the input has access to neural systems involved in affective as well as sensory activities [references deleted]. In the final analysis, the experience of pain is largely determined by the meaning of the stimulus. In doctors' offices, people flinch when there isn't much pain. The responses of injured children differ markedly depending on whether an audience is present. Placebos provide genuine relief of pain. Soldiers experienced different levels of pain from objectively similar wounds in World War II, Korea, and Vietnam. And many religious rituals in tribal cultures (e.g., fertility, puberty) would appear objectively painful, but elicit no signs of pain from the participants. Some blind people can profit from retinal implants, some deaf people can profit from cochlea implants, and all of this makes sense given what we know about the organization of the sensory modalities. Somehow, electrical signals representing a stimulus have to get to the relevant sensory projection area in the brain. Ordinarily this is accomplished by the sensory receptors and the sensory nerves, but it is possible, using modern electronic technology, to sidestep these parts of the process through sensory substitution technology. This approach to physical rehabilitation was pioneered by Paul Bach y Rita, a neurologist at the University of Wisconsin Nature, 1969). Bach y Rita connected a television camera to a matrix of 400 electrodes attached to the back of a blind patient. The camera converted the scene to a low-resolution image (essentially, 400 pixels), which was transmitted to the electrodes in the form of mild electrical shocks. The patient could then "feel" the scene through the tactile receptors in his or her skin. And it worked. Bach y Rita's subjects, all of whom had been blind from birth, learned to decode the pattern of somatosensory stimulation, and thus "see" the scene in front of them. There are limits on this technology. The equipment was bulky, but more important, the resolution of the scene was limited by what is known as the two-point threshold. If you stimulate two different points on the skin, and gradually bring the two points closer and closer together, there will come a point (sorry) where the two stimuli are indistinguishable, and the two physical points are perceived as only a single point. Although the skin is pretty sensitive, the two-point threshold effectively limits the resolution of the somatosensory "scene". You can make the physical matrix of electrodes smaller and smaller, that's just a matter of technology. But you can't reduce the two-point threshold -- unless you switch targets for the somatosensory stimulation to some other area of the body. In more recent work on a device known as the BrainPort, investigators following in Bach y Rita's footsteps (he died in 2006, but not before establishing an engineering company to develop his device) have applied a miniaturized electrode matrix, embedded in something that looks like a flat lollipop, to the tongue -- a very sensitive piece of skin with a very low two-point threshold. And it works. Similarly, the vOICe, the product of another company, translates the visual scene into a pattern of sound (brightness is represented by volume, and elevation is represented by pitch); yet another device, intended for the deaf, translates auditory stimuli into patterns of tactile stimulation, useful for burn patients who have lost tactile sensitivity in their skin. sending signals to to electrodes in the inner ear which connect to the vestibular nerve. All this technology works because, as Bach y Rita famously put it, "You hear with our brain, not with your ears". Aside from practical applications in rehabilitation, sensory substitution technology has interesting implications for sensory qualia. What's the modality of sensation? Retinal implants replace the retina, and cochlear implants replace the cochlea, but the electrical signals they generate still travel over the optic or auditory nerve to the primary visual or auditory cortex, respectively. With the BrainPort,, of course, the signals go to the somatosensory cortex in the parietal lobe, giving rise to tactile sensations; and with the vOICe, the signals go to the auditory cortex, giving rise to auditory sensations. But, apparently, that's not all. Some blind patients using the BrainPort and vOICe technologies report actually seeing, and brain-imaging experiments with subjects using the vOICe show activation in the visual cortex as well. If so, the experience of vision from tactile or auditory stimulation is, as Bach y Rita would have argued, a tribute to the plasticity of the brain. The issue warrants further study, and there may be lots of individual differences in this respect -- depending, for example, on whether the blindness is congenital, or the patient has had some experience of sight; of the amount of experience the patient has had with the technology; and, perhaps, even individual differences in mental imagery ability. In the present context, however, the most important point is that "there's something it's like" to see something, and that is different from what it's like to hear something. After Kant's "three irreducible faculties", there appear to be nine qualitatively different forms of sensation -- seeing, hearing, tasting, smelling, feeling touch, feeling warm and cold, and feeling pain. And each of these modalities is associated with the activity of a particular neural system. Psychology began as the scientific study of consciousness, even though it quickly lost that interest, and regained it only recently. At the beginning, psychologists relied on introspection -- literally, "looking into" the mind to see what is there. The roots of late-19th-century introspection lie in the psychophysics of the early 19th century, which examined the relationship between the physical properties of a stimulus (subject to third-person objectivity) and the psychological properties of the corresponding experience to which that stimulus gives rise (subject to first-person subjectivity). the absolute threshold, or the minimum intensity required for detection of a stimulus at all. Of course, the absolute threshold is really just a special case of the relative threshold -- that is, the difference between "nothing" and "something". In the method of adjustment, the subject -- not the experimenter -- varied the magnitude of the stimulus, and indicated when it (or a change) became detectable. An interesting application of classical psychophysics is the "Scoville Scale" that measures the "hotness" of chili peppers. In the Scoville scale, a standard amount of ground chili pepper is dissolved in a standard amount of syrup. The resulting ratio yields a measure of the "heat" in the pepper in question. The hottest habanero chilies score 577,000 Scoville units. The Bhut Jolokia scores at 1 million units. The Dorset naga rates 1.6 million units, and as of 2008 was counted as the world's hottest. The pepper spray sometimes used by police in riot control rates 2 million units. According to the psychophysical principle, every psychological property of a sensation is related to some physical properties of the corresponding stimulus. 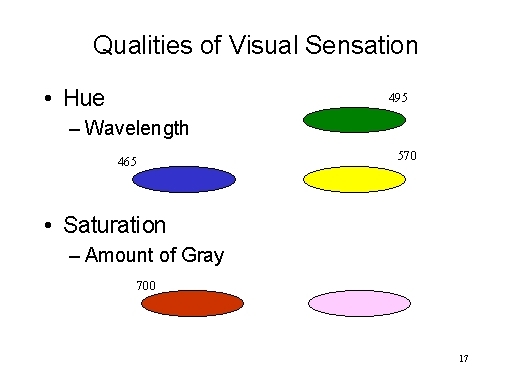 In vision, for example, the quality of hue (or color) is related to the wavelength of electromagnetic radiation that falls on the retina of the eye. Short wavelengths correspond to blue, longer wavelengths to yellow, etc. Another visual quality, saturation, is related to the amount of gray that is mixed with the color. For example, pink has more gray than red. In audition, the quality of pitch is related to the frequency of sound waves falling on the eardrum. In music, middle C, between the treble and bass clefs, has a lower frequency than third-space C on the treble clef. 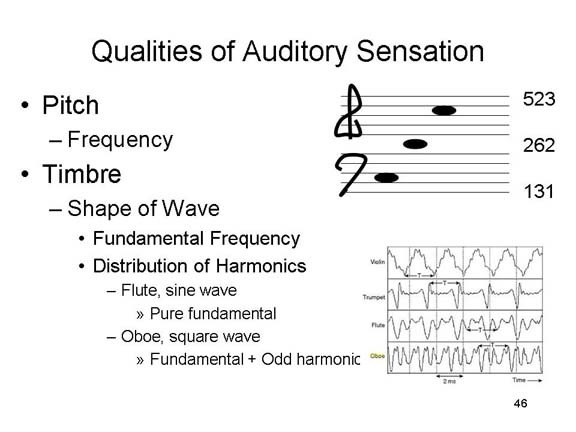 Another auditory quality, timbre, is related to the shape of the sound wave, which in turn is related to the number and distribution of harmonics above the fundamental frequency. The sound of a flute is characterized by a fairly "pure" sine wave, while the raspy sound of an oboe is characterized by a more square wave. Let's take the simplest psychophysical experiment first, on the absolute threshold for sensation. The question is: what is the minimum amount of stimulus intensity which will give rise to a conscious sensation? Ideally, there is an all-or-none relationship between intensity and sensation is isomorphic: That is there is some level of physical intensity, below which the stimulus cannot be seen or heard, smelled or tasted, or felt. In practice, however, detection thresholds can vary from subject to subject, and from trial to trial within a subject. Accordingly, the absolute threshold is defined as the intensity at which an observer detects the stimulus 50% of the time. There are thresholds for other dimensions, of course, which are determined in exactly the same way. And, so, for that matter, is the relative threshold: the minimum change in intensity which an observer detects 50% of the time. Stimuli which are detected less than 50% of the time are said to be subliminal. We'll have more to say about subliminal perception later, in the lectures on Explicit and Implicit Cognition. But truly subliminal stimuli aren't consciously detected at all. Stimuli which are detected more than 50% of the time are said to be supraliminal. Note that the shape of the actual curve relating intensity to detection is smooth and ogival. This fact, coupled with the existence of subliminal perception, undercuts the very concept of the threshold. At the very least, it seems that the threshold is a somewhat variable border between what is consciously perceptible and what is not consciously perceptible -- a border that can be placed at somewhat different locations depending the observer's biases and incentives, as well as sensory acuity. Such factors are taken into account by signal detection theory, which provides separate estimates of the sensitivity of the sensory system and the biases of the observer. But even in signal-detection theory, there is still some notion of the threshold -- some level of stimulus intensity that even the most sensitive system can't detect. Most early psychophysical research was focused on the dimension of intensity, or the experienced "strength" of a stimulus. In terms of the psychophysical laws, the intensity of experience was related to the amount of physical energy emanating from the stimulus and falling on the observer's sensory surfaces. Intensity is coded in the nervous system by the temporal and spatial summation of activity in sensory neurons. This much would seem fairly obvious. But, in fact, there is no isomorphism between physical and sensory intensity. For example, the relative threshold -- the amount of change in physical energy needed before that change is detectable -- depends on the intensity of the original stimulus. If the original intensity is low, even a very small change is noticeable. If it is high, a relatively large change is required. You may wish to do some other problems like this, using different Weber Fractions and different values of I, just to get a feel for the enterprise. 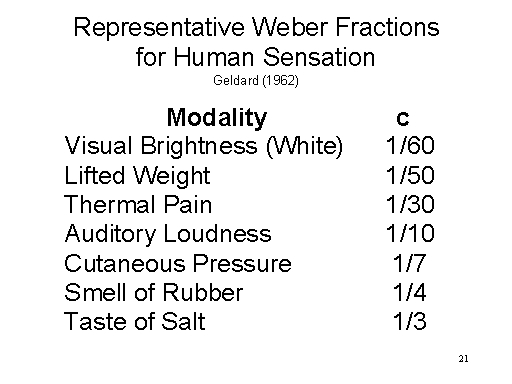 Weber's Fraction differs for each sensory modality, and for each species, and provides a universal index of the sensitivity of a modality. Thus, if a modality is associated with a small Weber's Fraction, it is highly sensitive (small JNDs). In humans, vision and audition are the most sensitive modalities, taste and smell the least. But in cats, Weber's Fraction for smell is 1/300 that of humans. log = a logarithmic function. sensation changes more slowly than stimulation. As stimulation grows from 1 to 200 units, sensation grows only from 0 to 2.3 units). This follows from Weber's Law: 10 additional units of stimulation makes a big difference to sensation at the bottom end of the scale, but a progressively smaller difference as we move towards the top. If you re-plot the relation between S and I on a logarithmic scale of I, you get a straight line. The 19th-century psychophysicists loved findings like this, because the simplicity and elegance of the straight line suggested that they had uncovered a basic law of mental life after all. Within limits, perceived length changes precisely with actual length. Experienced pain grows more rapidly than the pain stimulus. N = an exponent (either power or root). for any quality of sensation, there is an exponent that relates changes in sensation to changes in stimulation. Get out your calculators again, and we'll work through some examples. Again, although the precise values differ from those given in the illustration of Fechner's Law, notice that big changes in I yield small changes in S, just as predicted by Fechner. 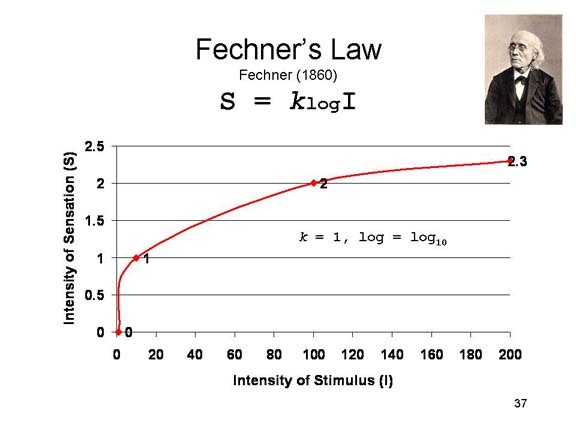 Where N = 1, you get the "length" exception to Fechner's Law, where every change in I produces an isomorphic change in S.
Notice that physical intensity grew from 1 to 200 units, but sensory intensity grew from 1 to 2828 units. Thus, even a small change in I produces a big change in S.
Some sensory systems expand stimulation (as in the "pain" exception). Stevens also found another exponent that related the size of the audience to the number of speech dysfluencies (stutterings, etc.) displayed by a public speaker. These kinds of relations go far beyond the transduction of stimulus energies. More recently, classical psychophysics, with its emphasis on thresholds, has been replaced by signal detection theory, which holds that detection is not merely a function of stimulus intensity, but also that the expectations and goals of the observer must be taken into account. Empirical studies based on systematic observation and controlled experimentation. The collection of quantitative data. And the derivation of mathematical functions relating the stimulus environment to conscious sensory experience. The intensity of a stimulus is often measured with a simple visual analogue scale (VAS) -- subjects are asked to mark a horizontal line to indicate how intense their experience is. Sometimes the VAS is labeled with numbers, e.g., from 0-10.
report pains above 10 when stressed for a while longer" (e.g., Hilgard & Morgan, 1975). In other applications, the VAS is unlabeled, and the investigator has to measure the distance to the patient's mark with a ruler, which is a real pain. VASs are often used clinically, to collect reports from patients of how much pain, anxiety, or depression they're feeling. They are also used by personality and social psychologists -- for example in the "attitude thermometers" commonly used in attitude research. However, some psychophysicists have criticized the standard VAS on the ground that a rating of "7" may mean one thing to one subject, and something entirely different to another one (though, frankly, Hilgard showed clearly that his open-ended VAS for pain behaved quite well in psychophysical terms). In order to put subjects on a more common footing, Linda Bartushuk, an expert on the psychophysics and physiology of gustation, have introduced a General Labeled Magnitude Scale (gLMS), in which various points on the scale are labeled with verbal descriptors, as follows (Bartoshuk et al., Currrent Directions in Psychological Science, 2005; illustration from "Relief: Scientists Harness the Power of Perception to Fade Out Chronic Pain" by Rachel Adelson, APS Observer, 28(9), 11/2015). Bartoshuk was not, of course, the first to label points on the VAS. But note that her labels do not correspond precisely to the various numbers" -- or, for that matter, to our intuitions. A rating of "Very Strong", for example, is near the midpoint on the scale, somewhere between 5 and 6. They claim that this form of VAS has better psychometric properties than the usual alternatives. Classical psychophysics was largely focused on the problem of intensity, but even within the tradition of classical psychophysics, it was clear that there are other measurable attributes of sensation besides intensity. In principle, these different qualities of sensation are also subject to the psychophysical principle, in that each corresponds to some physical quality of stimulation. And, in principle, these different qualities of sensation also follow the psychophysical law, such as Stevens' Law. But before we can get to psychophysical laws and principles, we need to know what these basic, primary, irreducible dimensions are. To a large degree, that task fell to the members of a school of psychologists known as Structuralism. who employed a method known as introspection to determine what these attributes were -- in other words, to identify what Edwin G. Boring, the great Harvard historian of psychology, called the physical dimensions of consciousness (Boring, 1953). Introspection was introduced by Wilhelm Wundt, a German psychologist who founded the Structuralist school, and refined by E.B. Titchener, Wundt's American disciple, who founded the psychological laboratory at Cornell. Through the method of experimental introspection, stimulus conditions were carefully varied, and subjects were asked to describe their conscious experiences in terms of their constituent elements. The intended result was a sort of mental chemistry, in which sensory experiences, analogous to molecules, were analyzed into their constituent elements, analogous to atoms. In their work, the Structuralists argued for a parallel between physics and psychology (they were, after all, psychophysicists!). 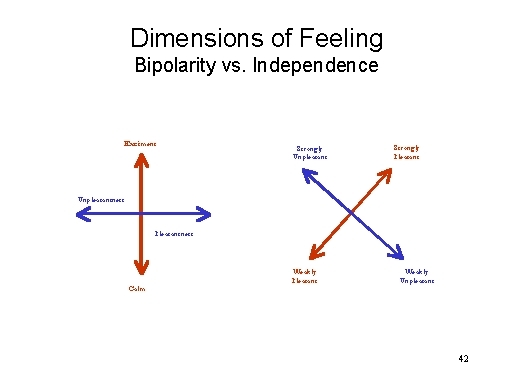 These are known as the psychophysical parallels. protensity (duration of an experience in time). quality, or the individualizing attributes of a sensory experience. While the classical psychophysicists, like Weber and Fechner, focused on sensory intensity, the structuralists focused on sensory qualities. The sensory qualities, in turn, differed according to modality. "...produced from estate grown grapes at RoxyAnn, the 2004 Syrah displays a dense, purple-black appearance with powerful, forward aromas of grilled plums and cracked black pepper accented with earth and tar notes. Dark and juicy, this wine is polished and smooth, with ripe integrated tannins layered over a chewy mouthful of concentrated blackberry, cherry, and white pepper. Lush perfumed spice and loads of ripe blueberry and blackberry flavors reveal lavender blossoms and a gentle touch of spicy oak on the long, lingering finish" (from an ad for RoxyAnn Winery in the Ashland (Or.) Glad Tidings, 09/15/06). The example isn't perfect, not least because the structuralists would have sought to break down even these elements, such as "grilled plums" and "cracked black pepper" into their constituent elements as well. Moreover, describing a taste in terms of "blackberry" and "cherry" commits the stimulus error described below. But, still, you can get the idea. The general idea of what the Structuralists were up to is given by the color circle, which shows how the four primary hues, varying in saturation, can be combined to yield a whole host of complex colors. Reversing the process, if you introspect on your experience of seeing a complex color, you can analyze it into basic elements of red, green, yellow, blue, and gray that can't be further reduced. And in this way you get the basic elements. These are qualia. The examples that follow were constructed with PowerPoint presentation software, and they may show up a little differently on your screen, but you'll get the idea. When you look at this color swatch, what do you see? Most people will see red, and nothing else. When you look at this one, you see green, in addition to the red, in roughly equal amounts. You see red and green here, too, but whereas in the earlier slide there was more red than green, now you see more green than red. In this stimulus, you see both red and blue, but more red than blue. Here you also see both red and blue, but now there is more blue than red. By contrast, this is a pure blue. You don't see any other hue in this stimulus. Here, the proportions of red and blue are precisely equal. And here, the mix is equal parts blue and green. And so it goes. The structuralists would present their observers with complex sensory stimuli, and then ask them to analyze their experience into its basic constituent elements. Introspection, a technique introduced by Wundt and refined by Titchener (who, in turn, was Boring's mentor in graduate school) required careful training of observers, so that they would avoid the "stimulus error" of describing the stimulus, and its meaning, rather than the qualities of the sensory experience to which the stimulus gave rise. For Wundt and Titchener, the stimulus error reflected a confusion between observation and inference -- and because introspection was construed as the empirical observation of conscious experience, inferences were to be avoided at all costs. The rule of experimental introspection, in the sphere of sensation, runs as follows: Have yourself placed under such conditions that there is as little likelihood as possible of external interference with the test to be made. Attend to the stimulus, and, when it is removed, recall the sensation by an act of memory. Give a verbal account of the processes constituting your consciousness of the stimulus. In whichever form it is employed, the introspective method demands the exercise of memory. Care must therefore be taken to work with memory at its best: the interval of time which elapses between experience and the account of experience must not be so short that memory has not time to recover the experience, or so long that the experience has become faded and blurred. In its experimental form, introspection demands further an exact use of language. The terms chosen to describe the experience must be definite, sharp, and concrete. The conscious process is like a fresco, painted n great sweeps of colour and with all sorts of intermediary and mediating lights and shades: words are little blocks of stone, to be used in the composition of a mosaic. If we are required to represent the fresco by a mosaic, we must see to it that our blocks be of small size and of every obtainable tint and hue. Otherwise, our representation will not come very near to the original. The rules for introspection are of two kinds: general and special. the latter refer to the regulation of stimulus, and differ in different investigations; the former refer to the frame of mind, and must be observed in all investigations alike. Suppose, e.g., that you were trying to find out how small a difference you could distinguish in the smell of beeswax; that is, how much greater the surface of the stimulus must be made if the sensation of smell is to become noticeably stronger. It would be a special rule that you should work only on dry days; for beeswax smells much stronger in wet than in fine weather. Or if you were trying to discover how well you could call up the smell of beeswax in your mind, without having the wax under your nose, it would be a special rule that you should perform the experiment in a perfectly odourless room, so that the excitation set up from inside the brain should not be interfered with by foreign stimulations set up in the smell-cells of the nose. Again, if you were trying to distinguish all possible tints of blue, it would be a special rule that you should work always by the same illumination: always by dull daylight, or always by the same electric lights, etc. For a blue seen in sunlight is different from the same blue seen in dull daylight. Be impartial. Do not form a preconceived idea of what you are going to find by the experiment; do not hope or expect to find this or that process. Take consciousness as it is. Be attentive. Do not speculate as to what you are doing or why you are doing it, as to the value or uselessness, during the experiment. Take the experiment seriously. Be comfortable. Do not begin to introspect till all the conditions are satisfactory: do not work if you feel nervous or irritated, if the chair is too high or the table too low for you, if you have a cold or a headache. Take the experiment pleasantly. Be perfectly fresh. Stop working the moment that you feel tired or jaded. Take the experiment vigorously. We are constantly confusing sensations with their stimuli, with their objects, with their meanings. Or rather -- since the sensation of psychology has no object or meaning -- we are constantly confusing logical abstraction with psychological analysis; we abstract a certain aspect of an object or meaning, and then treat this aspect as if it were a simple mental process, an element in the mental representation of the object or meaning.... We do not say, in ordinary conversation, that this visual sensation is lighter than that, but that this pair of gloves or this kind of grey paper is lighter than this other. We do not say that this complex of cutaneous or organic sensations is more intensive than that, but that this box or package is heavier than this other. We do not even say, as a rule, that this tonal quality is lower than that, but rather that this instrument is flat and must be tuned up to this other. Always in what we say there is a reference to the objects, to the meaning of the conscious complex. It is not the grey, pressure, tone, that we are thinking of; but the grey of leather or paper, the pressure of the box, the pitch of the violin.... What is more natural than to read the character of the stimuli, of the objects, into the 'sensations' with which certain aspects of the stimulus or object are correlated...? Of course, we could also say, as with James and Brentano, that if the goal of Structuralism is to produce a pure description of experience, then Structuralism misses the point. If mental states are about things other than themselves, then confining introspection to the mental state, and avoiding the object that it represents, isn't desirable -- or even possible. But let's set that point aside, and see where the Structuralist analysis of sensory qualia takes us. It turns out that it takes us to some pretty good places. Boring, E.G. (1921). The stimulus error. American Journal of Psychology, 32, 449-471. Boring, E. G. (1953). A history of introspectionism. Psychological Bulletin, 50, 169-189. Danziger, K. (1980). The history of introspection reconsidered. Journal of the History of the Behavioral Sciences, 16, 241-262. Titchener argued that the elements of conscious experience could be grouped into two classes: sensations and feelings. He engaged in a dispute with Kulpe, another Structuralist, over the role of memory images, and whether there were ever imageless thoughts. Other structuralists argued that feelings were themselves sensations (you can see a shadow of this position in the James-Lange theory of emotion, which asserts that emotional feelings are actually the perception of bodily responses to a stimulus event). Still others asserted that images were sensations as well -- albeit excited centrally, though thought and memory, rather than peripherally, through stimulation and transduction. In any event, introspection focused almost exclusively on the qualities of sensation -- although, as we will see, Wundt later instigated a debate about the basic qualities of feeling. Hue or color, consisting of black (the absence of any color), white (the presence of all primary colors), and the psychological primaries of red, yellow, green, and blue. They also added gray to the list, giving rise to another fundamental quality of visual experience, saturation. In audition, there are fundamental qualities of pitch and timbre, also discussed earlier. The Structuralists also debated whether there were additional somesthetic qualities of roughness and wetness. The question, as always, was whether these were irreducible qualities of somesthetic experience, or whether the qualities of roughness and wetness were actually blends of elementary dimensions such as pressure and pain. More recently, the list of potential tactile qualia has been expanded to include soft vs. hard, tickle, and hot. 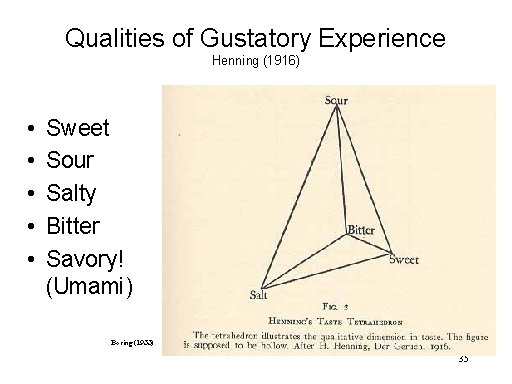 In 1916, the Danish structuralist Henning, following up on earlier analyses by Hanig (1901), arranged these four gustatory qualities into a taste tetrahedron. In principle, according to Henning, the complex taste of any substance could be represented as a point in the space defined by the surfaces of the tetrahedron -- so much sour, so much salt, so much sweet, or whatever. Think of it the taste tetrahedron as a kind of "color circle" for taste. As it happens, recent research (by Japanese investigators) has revealed a fifth basic taste, known as umami, which is a Japanese word meaning savory or deliciousness. Umami is a taste ingredient found in much Chinese and other Asian food, and is particularly present in monosodium glutamate (MSG) and soy sauce. It is also present in some meats and cheeses, though perhaps not in Denmark, which is why Henning didn't discover it. Again, Henning arranged a smell prism for representing the complex smell of any substance as a point in the space defined by the surfaces of the prism. Qualia refer to consciously perceptible qualities of sensation. But in the case of olfaction, there appear to be unconscious olfactory sensations -- namely pheromones (Karlson & Luscher, 1959). Pheromones are odorants, but they don't give rise to conscious olfactory sensations. Still, these odorants are known to affect the social behavior of a wide variety of animals, including humans. Martha McClintock's work on menstrual synchronization among women who live together in close quarters is a famous example. Although taste (gustation) and smell (olfaction) are basic modalities of sensation, the flavor of any food is given by a combination of taste, smell, and touch. This is easily demonstrated by tasting a strawberry (without, of course, knowing that it is a strawberry -- otherwise you're liable to commit the stimulus error! -- while holding your nose. You will taste the sweet of the fruit, but you will not taste the flavor of strawberry until you breathe again. Similarly, irritants like carbonation, mint, and pepper contribute to flavor through the tactile modality. What pepper contributes to the taste of food is -- not to put too fine a point on it -- tactile pain. Speaking of touch, Titchener (1920) was inspired by Henning to devise a tentative touch pyramid to map the relations among the various qualities of touch. As with smell and taste, any tactile sensation could be located somewhere on the surface of this pyramid. A somewhat different list of tactile qualities was advocated by E.g. Boring, Titchener's student, historian of psychology, and longtime professor at Harvard. We don't have to get distracted by the differences between teacher and student. Titchener's touch pyramid is offered here as just another example of the Structuralist approach to the identification of qualia. Any such proposal, of course, is highly dependent on an accurate determination of just what these basic qualia are, and here the matter can get complicated. For example, just as there may be a fifth quality of umami in taste, so there may be a seventh quality of alkaline in smell. And we still don't know how many somesthetic qualities there are. Still, this level of uncertainty hasn't prevented the perfume industry from using the basic olfactory elements to synthesize new odors. similarly, the basic elements of taste are used by the food technology industry to synthesize new flavors (see "The New Spice Trade", The Economist, 06/22/02). The Structuralists' introspection was not just an abstract exercise. Rather, it laid the basis for understanding the neural substrates of sensory qualia. Recall that in the early 19th century, Johannes Muller had proposed the Doctrine of Specific Nerve Energies -- basically, that each modality of sensation was associated with a separate neural system. Herman von Helmholtz, who had been Muller's student, proposed an extension of Muller's doctrine, the Doctrine of Specific Fiber Energies (1863, 1865) such that different neural systems underlay each quality of sensation with each modality (Helmholtz also came up with the idea of sensory modality itself). So, at least in theory, each of different qualities of sensation is mediated by a different neural system which is dedicated to that purpose. As it happens, the neural bases of these different qualities has actually been worked out -- at least for some qualities, in some modalities. Through additive mixture of red, green, and blue. Or through subtractive mixture of red, yellow, and blue. "Blue" cones, sensitive to short wavelengths. "Green" or "yellow" cones, sensitive to medium wavelengths. "Red" cones, sensitive to long wavelengths. As stated by Hering, and by Hurvich and Jameson, opponent-process theory was a psychological theory, inferred from the data of human performance. More recently, however, investigators such as the late Russell DeValois at UCB, have identified the physiological substrates of the opponent processes. the multiple cumvallate papillae, which line up along the back of the tongue, appear to be maximally sensitive to bitter tastes. There's no mention in this work of umami. The whole idea of a "tongue map" is disputed by some authorities, such as Yale's Linda Bartoschuk. For a long time, it was thought that receptors specific to the four "basic tastes" -- sweet, sour, salty, and bitter -- were located in discrete areas of the tongue. The sensation of sour is most acute at the sides, least at the tip and base. The sensations of sweet and salty are most acute at the tip, least at the sides, and base. The sensation of bitter is most acute at the base, and on the throat and the palate. This suggests that there may be four different receptors, each sensitive to a different basic taste, and each uniquely distributed on the tongue -- after the manner of the "tongue map" proposed by E.G. Boring in 1942. 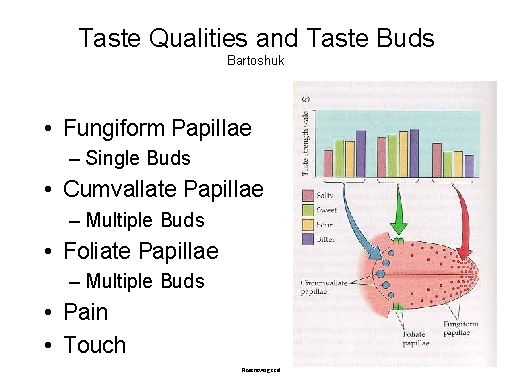 Unfortunately, histological studies have failed so far to reveal differences in the taste buds at various sites on the tongue, so the precise organization of taste remains something of a mystery. While it's true, to some extent, that different areas of the tongue are differentially sensitive to the various basic tastes, the situation is more complicated than this -- not least by the discovery of umami, that fifth basic taste, which made Boring's "taste map" more than a little quaint, much like maps of the world printed before 1492. More critically, it appears that clusters of cells, each sensitive to different chemical molecules, are dispersed widely across the tongue. Much in the manner of color vision, these clusters may be maximally sensitive to particular molecules, they are also responsive to others. And much in the manner of color vision, the output from these receptors seem to be integrated at high levels of the nervous system to yield the sensation of taste. How Do We Know What the Qualia Are? But before we can go looking for the neural substrates of different sensory qualia, we have to know what those qualia are -- the psychology always precedes the neurology. Which begs the question: how do we know a basic sensory quality when we see (or hear, or taste, or smell, or touch) it? Physical Mixture: Some mixture of the basic qualities must yield all the other sensory qualities (in the same way that a mixture of red and blue yields purple). Physiological Attunement: As for Helmholtz, there should be a unique neural pathway for each primary quality. Language: We expect basic qualities to be monolexemic, represented by single words in language, as in blue or green as opposed to blue-green. We can also expect the words representing basic qualities to be characterized by high frequency of use. Cultural Salience: We would expect primary qualities to be encoded in most languages. Interestingly, cross-cultural studies of language by Berlin and Kay revealed a progressive emergence of color names. If a language has only two color names, they are black (or dark) and white (or light). If a language has more than two color names, they are red, yellow or green, and blue. If a language has more than six color terms, they are grey, pink, orange, purple and brown. Etymology: Returning to language once again, Cutting notes that the basic colors, black, white, grey, red, yellow, green, and blue do not refer to any other object. They are only about themselves. They are abstract. By contrast, non-basic color terms like orange, violet, olive, etc. are borrowed from objects. In a sense, you can't use these terms without making the stimulus error or describing the stimulus rather than the experience (as in "It looks like the color of an olive"). Linguists refer to such analogical terms as source-based. It would be an interesting exercise to apply Cutting's criteria to proposals for basic qualities in other domains (hint, hint). Consider, for example, some recent cross-cultural work on odor-identification by Asifa Majid and her colleagues at the University of Nijmegen in The Netherlands, who have studied the odor lexicons of various Aslian languages spoken by indigenous tribes on the Malay Peninsula (e.g., Majid & Kruspe, Current Biology, 2018). English-speaking subjects are pretty good at naming colors, a property which linguists call codability. But we're very bad at naming odors. The traditional explanation for this difference is that human evolution has favored vision over olfaction. For example, primates have much smaller olfactory bulbs than other mammals. But it's also true that English has dedicated abstract terms for many colors, like red, yellow, green, and blue; by contrast, most odor terms in English are source-based, like lemony and medicinal. About the closest that English gets to a monolexemic, abstract odor-word that's doesn't refer to something else is musty -- and even that word means "smells like must". 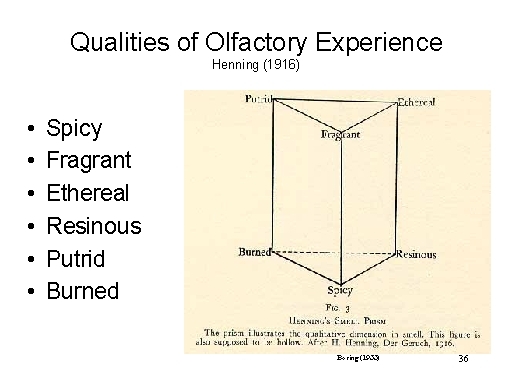 Think of Henning's smell prism, discussed earlier, which contains "basic" terms like resinous (smells like resin) and burned (smells like something that's burned). But that's not true for every language. The Jahai and the Maniq, indigenous tribes of hunter-gatherers living on the Malay Peninsula, have no difficulty naming odors. They perform as well as English speakers when asked to name colors, and much better than English speakers when asked to name odors. Interestingly, their languages have about a dozen monolexemic, abstract words for odors. This pretty much disproves the hypothesis that the difficulty that English speakers have in naming odors is due to the impoverished nature of the human olfactory apparatus. In fact, at first glance, this looks like a Whorffian result -- that is, the Jahai have words for odors, and this feature of language affects their ability to perceive odors. Of course, this is contrary to the findings of Heider, who found that differences in color vocabulary had no effect on color perception. It might also have to do with the fact that the Jahai and Maniq are hunter-gatherers, who might have evolved a distinctive olfactory apparatus which enables them to survive in a jungle that presents them with lots of different smells. This would be a contra-Whorffian" hypothesis, that differences in sensory acuity led to differences in language. But again, you'd be wrong. Consider two other indigenous Malay people, the Semaq Beri and the Semelai. These tribes speak related Aslian languages, both of which have a vocabulary of basic odor terms similar to those of the Jahai and the Maniq. But they have different lifestyles. The Semaq Beri are hunter-gatherers like the Jahai and Maniq, while the Semelai are sedentary farmers. It turns out that the Semaq Beri, like the Jahai, are as good at naming odors as they are at naming colors; but the Semelai are much worse -- despite having a language with lots of basic odor terms. So this is definitely a contra-Whorffian result. The Semelai have a language (which presumably arose at a time when they, too, were hunter-gatherers) with lots of odor-terms, but that doesn't help them name odors. Instead, the differences in odor-naming seem to be cultural in origin, having to do with the different local environments ("human-space" vs. "forest-space" in which these tribespeople live. The point of all this is to suggest that English-speakers may not be the best subjects to use for studies of sensory qualia outside of vision and audition. For hunter-gatherers like the Jahai and the Semaq Beri, odors are codable in abstract, monolexemic terms, as Cutting suggest. But for members of developed Western societies, we've somehow lost that code, and have to make do with the source-based labels that are left to us -- and these may not match up to the actual qualities of sensory experience. Qualia are irrevocable and indubitable. The representation of basic qualities is automatic and immutable. Outputs are potentially infinite. Once created, our use of these representations is unbounded. Inputs create representations in short-term memory. These representations serve as the basis for response outputs. Attention is required for outputs, but not for inputs. The primary dimension, naturally, was pleasantness-unpleasantness. strain-relaxation, roughly corresponding to the speed of arousal. Titchener countered with a different proposal, that pleasantness-unpleasantness was the sole dimension of feeling. We can see in this system rough analogies to Wundt's three primary psychological dimensions of extensity, intensity, and protensity -- and thus to the fundamental dimensions of space, mass, and time in classical Newtonian physics. Wundt was nothing if not consistent. 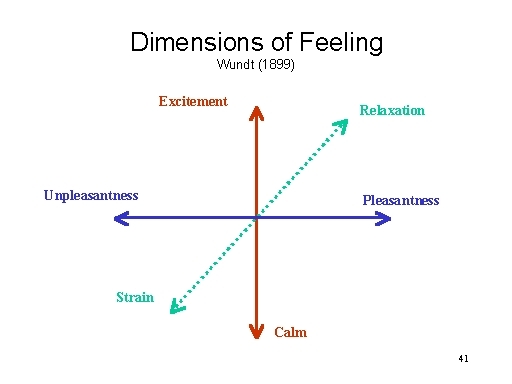 Note, however, that while the sensory attributes are unidimensional (at least, intensity and protensity vary from zero to infinity), Wundt's dimensions of feeling are bipolar. For Wundt, pleasantness and unpleasantness were opposite poles of a single dimension. A "zero" degree of pleasantness, like a zero" degree of unpleasantness, lies at the midpoint of the dimension. Similarly, calm is not just the absence of excitement, and relaxation is not just the absence of strain: they are somehow opposites. Wundt's assertions in this regard were debated by Titchener, who argued that pleasantness-unpleasantness was the sole dimension of feeling. Titchener agreed, however, that pleasantness and unpleasantness are negatively correlated, comprising opposite poles of a single continuum..
Boredom is a state of weak negative affect. Satisfaction is a state of weak positive affect. Fear is a state of strong negative affect. Delight is a state of strong positive affect. 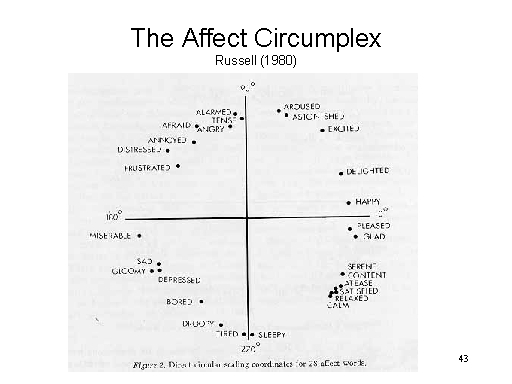 Russell's affect circumplex is essentially Wundt's solution to the structure of affect, imported from the late 19th century into the late 20th. Later, Watson and Tellegen argued for an alternative circumplex, in which positive and negative affect are independent of each other. 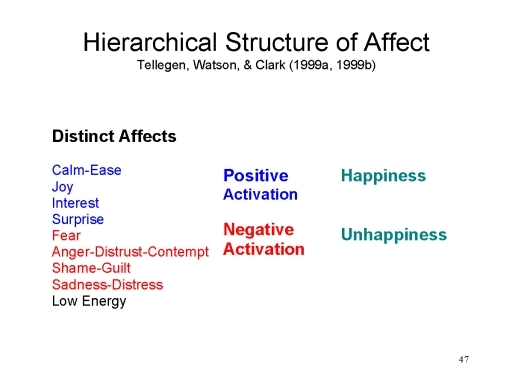 In the Watson-Tellegen circumplex, there are two big dimensions, one of strong-to-weak positive affect, and one of strong-to-weak negative affect. In principle, it is possible to be in a state characterized by high degrees of both positive and negative affect -- as in states of high arousal, astonishment, or surprise. Just as the 19th-century structuralists got into endless debates about the structure of sensory experience, so 20th- (and 21st-) century emotion researchers have gotten into a seemingly endless debate about the structure of affect. For example, affect circumplexes are generated by a statistical technique known as factor analysis, which is based on the correlation coefficient. For technical reasons that need not detain us here, there is a certain amount of subjectivity in the placement of principal factors. 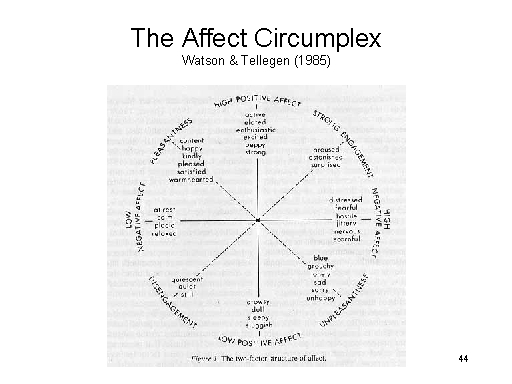 Note, for example, that in the Watson & Tellegen affect circumplex there is, in fact, a bipolar dimension of pleasantness-unpleasantness, just as Wundt and Russell maintained. It's just that Watson & Tellegen believe that the independent factors of positive and negative affect are stronger, and dominate the statistical solution. A further problem, unfortunately, is that correlation coefficients are not perfectly reliable, and seemingly minor differences from one study to another can lead to major discrepancies in the placement of factor axes. It does not help, either, to note that Russell and Watson & Tellegen factor-analyzed somewhat different sets of emotion terms. For these and other reasons, both substantive and non-substantive, an enormously vigorous dispute over the correct structure of affect continues to this day. For example, Donald Green, a political scientist interested in political attitude polling, and Peter Salovey, a psychologist interested in emotion, have argued that the Wundtian structure is the correct one after all. 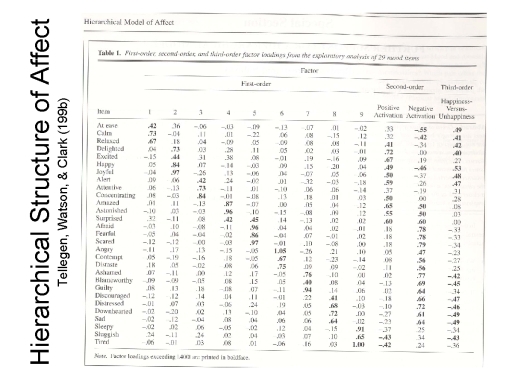 In one study, Green, Goldman, & Salovey (1993) factor-analyzed affect ratings, using a multi-trait multi-method methodology to reduce measurement error, and obtained solid evidence that happiness and sadness were opposites, rather than independent constructs. Tellegen and Watson (1999a, 199b), for their part, offered a new hierarchical factor analysis that provides yet a third perspective on the structure of affect. Analyzing the relations among 27 3-item scales measuring 9 content categories of affect, Tellegen and Watson found two strong "secondary" factors, independent of each other, tapping positive and negative activation -- essentially confirming their earlier results. 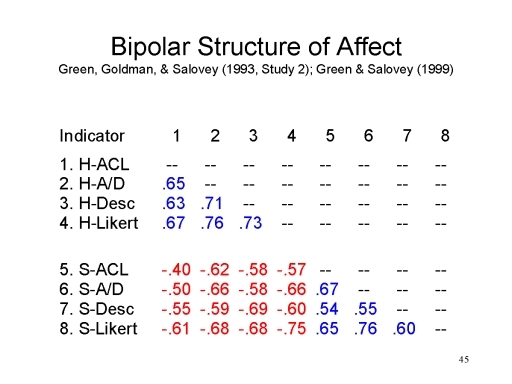 However, a further analysis yielded a single "tertiary" factor of happiness-unhappiness -- essentially, the bipolar structure favored by Wundt, Russell, and Green and Salovey. So, the structure of affect appears to depend on the level of analysis. Determining the basic qualities of affective experience seems a necessary first step in determining the neural substrates of those mental states. So, for example, if pleasure and unpleasure are polar opposites, we might expect that affective feeling states are mediated by a single brain system. But if pleasure and unpleasure are independent of each other, we would expect to find to separate, independent brain systems for affective feeling -- one for pleasure, the other for unpleasure. If, as Paul Ekman, has proposed, there are about a half-dozen basic emotions -- joy, sadness, surprise, anger, fear, and disgust -- then we would expect to find a separate brain system mediating each of them. But before we go looking for brain systems, we're going to have to have some idea what we're looking for. If Ekman is wrong, and there are more than a half-dozen basic emotions, then we'll never find all the brain systems that are involved in our emotional lives. Consider, for example, the case of pain. Studies of clinical patients (and laboratory subjects) experiencing pain, using such instruments as the McGill Pain Scale (Melzack & Torgerson, 1971; Melzack, 1975) reveal that the pain experience comes in several different kinds. Each of these kinds of pain appear to be mediated by a different neural system. Sensory Pain, which indicates the location and severity of an injury, appears to be processed in the somatosensory cortex of the parietal lobe. Suffering, which has more to do with the meaning of the sensory pain, appears to be processed in the anterior cingulate cortex of the frontal lobe. "Fast" pain, which is characterized by sharp, piercing pain, and results in a quick withdrawal reflex. Fast pain is mediated by "A-delta" fibers, and the neo-spinalthalamic tract in the spinal cord. "Slow" pain, which is characterized by dull, aching pain, and results in no withdrawal reflex. Slow pain is mediated by "C" fibers, and the paleo-spinalthalamic tract in the spinal cord. Apparently, however, both fast and slow pain signals end up in the somatosensory cortex. 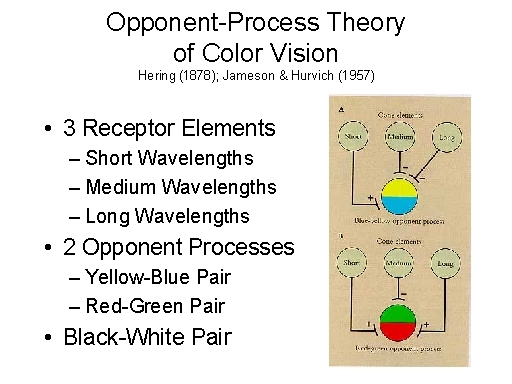 These proposals are somewhat controversial; and, as in the Young-Helmholtz theory of color vision, they may be wrong. But we'll never find the neural substrates of sensory qualia unless we know that the qualia are first. The psychology comes first. Why did the structuralist program fail? Partly, it was cut short by the onslaught of behaviorism. Partly, it was eaten from within by debates over things like imageless thought. But more important, the structuralists' fundamental assumption -- that conscious experience could be analyzed into its sensory elements -- was undercut by the Gestalt psychologists who showed that, in perception, "the whole is greater than the sum of its parts". But setting aside these debates, the program was sidetracked by its focus on qualia rather than intentionality. By rigorously training introspective observers to avoid the stimulus error, the structuralists neglected the fact that mental states are not pure and abstract experiences; they are always "about" something. This page last modified 03/10/2018.